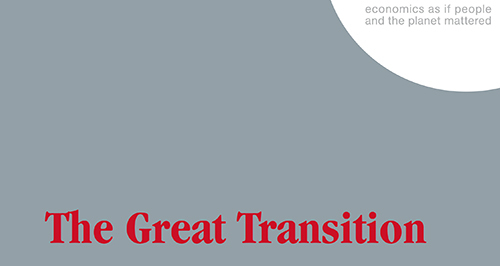 In the report “The Great Transition: A tale of how it turned out right”, the independent organization The New Economic Foundation, presents why and how the economies have to change. Even though the focus is on the UK it is also relevant for other countries around the world. The world is faced with multiple, complex and interlinked system problems – including environmental change, climate change, loss of biodiversity, untenable inequality, economic instability etc. The report argues that if we want to tackle these problems we need to create a different kind of economy. Recognizing that “business-as-usuall” is not an option anymore, the report lay the rout to an alternative future, and tale of how it turned out right in 2050. It sketches out how societies can do the great transition to a new economic system where resources are shared more equally, where communities and societies are thriving, where natural environments are safeguarded, and where societies can focus on what matters and on achieving genuine and lasting progress. Down load the Report and visit the New Economic Foundation to learn more.